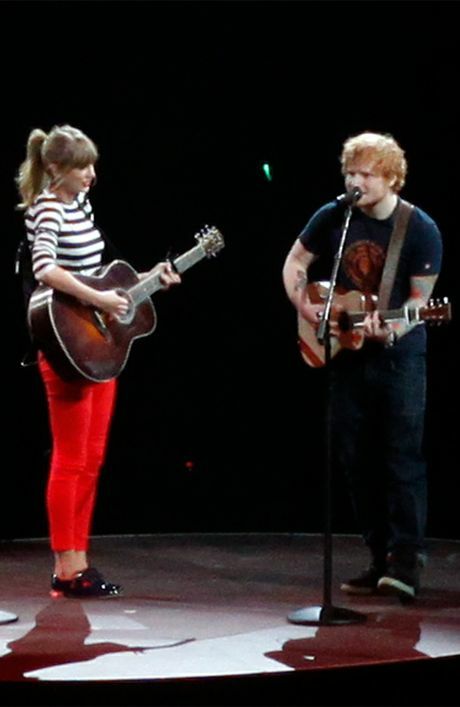 ED SHEERAN and Taylor Swift have become very close friends on her 'Red Tour'. Ed, 22, and 23-year-old Taylor have developed a special bond on the road and the pair hang out together most days backstage and after the concerts. Speaking to E! News, Ed said: "I go there, hang out with Taylor, I play a show, do my duet with her, then I hang out a bit more and then I go. So, really, it's a nice tour. "Six months is a long time to go on tour and leave your family and friends and if you haven't got a friend on the road it can get quite lonely." Ed - who recorded the song 'Everything Has Changed' with Taylor - is having the time of his life supporting the country star and has been getting a huge buzz each night because of the reception his songs are getting from the audiences. Speaking to Parade.com, he explained: "I'm loving the 'Red Tour'. It's fun. Singer/songwriters always say they prefer smaller venues, but there's nothing like playing to 15,000 people a night and having them scream lyrics that you've written back to you." Although Ed and Taylor - who previously dated the 'Lego House' singer's friend Harry Styles - are great pals he has so far resisted playing one of his famous backstage pranks on her because he isn't sure how she'd react. He said: "I don't know if I'd get forgiven if I pranked her, so it has happened yet!"